Polina is a highly skilled HR professional with a strong operational background and more than 5 years` generalist HR experience. She has worked in private and educational sector organizations in Europe and the UK across resourcing and retention, on-boarding, employee relations, talent management and organizational development. Polina is passionate about organizations, their culture and people and enjoys finding HR solutions to solve business problems. Throughout her career she has consistently led and delivered a number of high profile projects ranging from workforce planning to the design and implementation of an appraisal system. 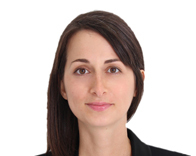 Prior to joining PeopleFirst, Polina was responsible for overseeing the HR Shared function of Westminster University in the UK, where she provided delivery and management of the full range of HR activities. Polina is an Associate member of the CIPD and holds a 1st Class Degree in Business Administration from University of Hertfordshire, UK.